I have quite the obsession with vintage glassware! Glassware is another one of the vintage items I collect in addition to costume jewelry and handbags. 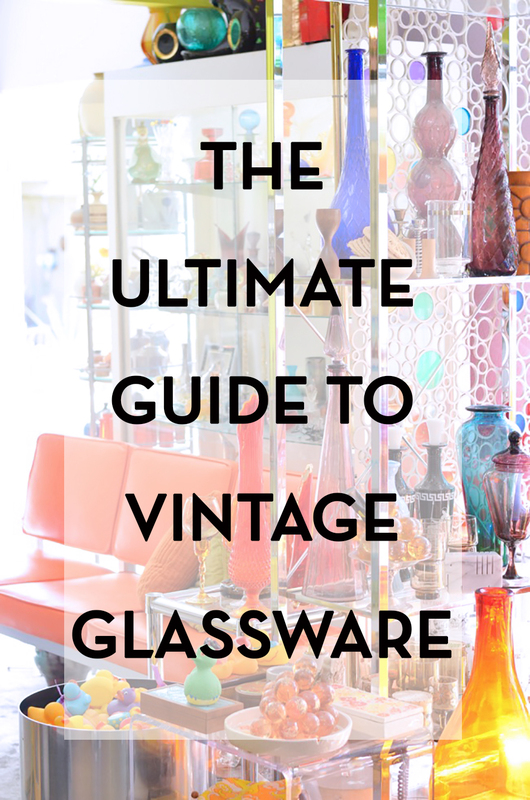 I’ve been asked several times to put together a guide to the most popular, or at least, my favorite vintage glassware. 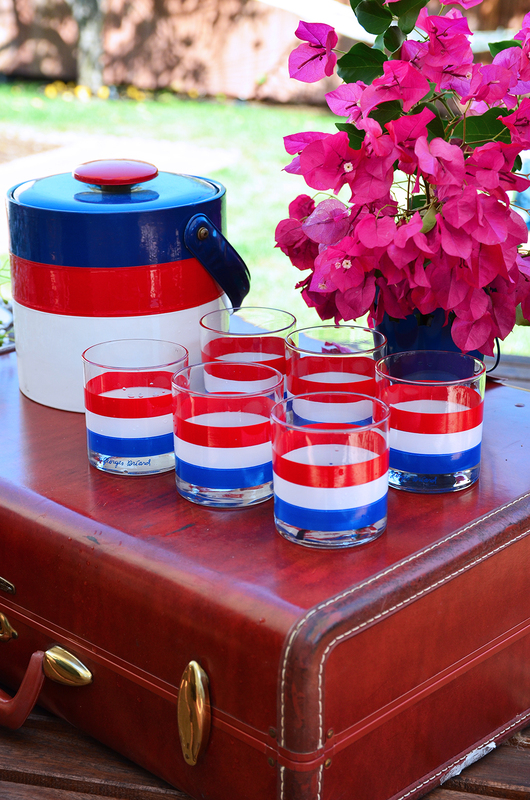 You can get lucky by finding vintage glassware by rummaging around at garage sales or at the flea markets and get lucky. 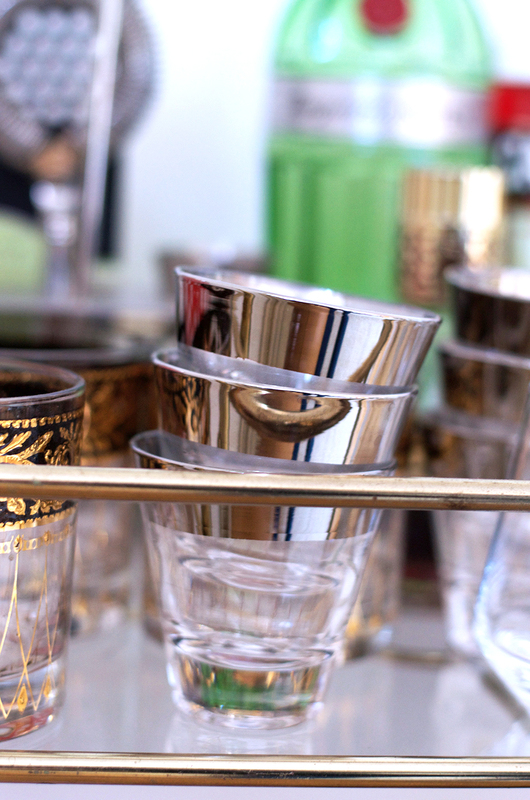 Most people, however, don’t know what to look for when selecting a good piece of vintage glassware because there is a LOT of vintage glassware out there ranging from antique crystal to more refined mid-century glassware. The markings, color, shape, and other details all play a part in understanding the history and value of glassware. 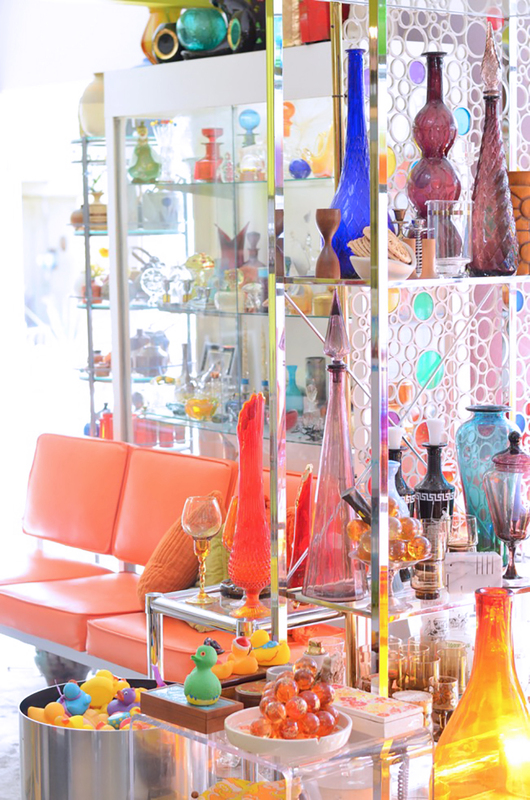 By knowing what to look for, you’ll know when to splurge on a valuable piece of glassware to add to your collection. More often than not, just knowing the various brands and style gives you a better appreciation for the fine art of glassware. My take on it– if you love it then collect it – it doesn’t have to cost a fortune to be a great find or collectible piece. 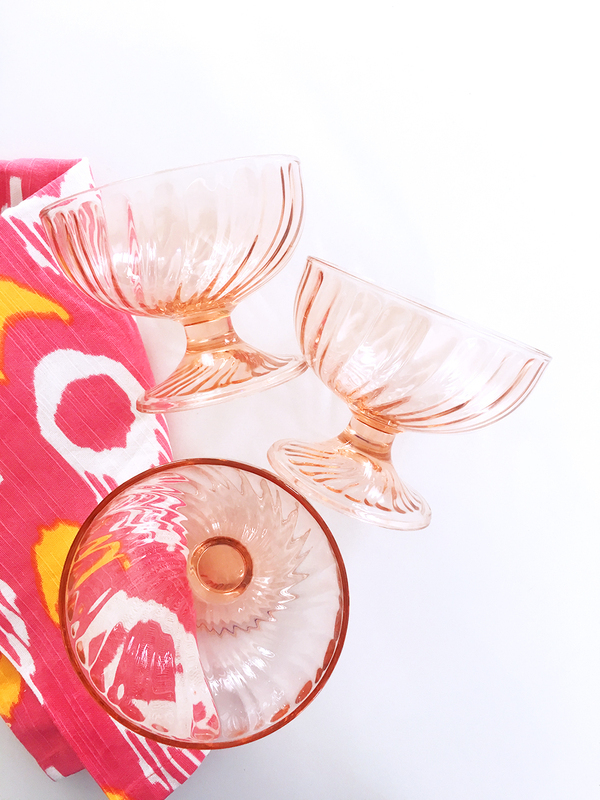 I’ve focused on my favorite and most recognized vintage glassware from the mid-century period. Anyone who knows me knows that Blendo glassware is by far my favorite vintage glass to collect. Blendo glass was made by West Virginia Glass Company and was really popular in the 1950s and 60s and is still relatively easy to find now. Blendo glass is characterized by a bright neon/pastel solid base that fades as it goes up the glass and a gold rim. You’ll see repros and knock off brands that have the base color, but not the signature gold rim. 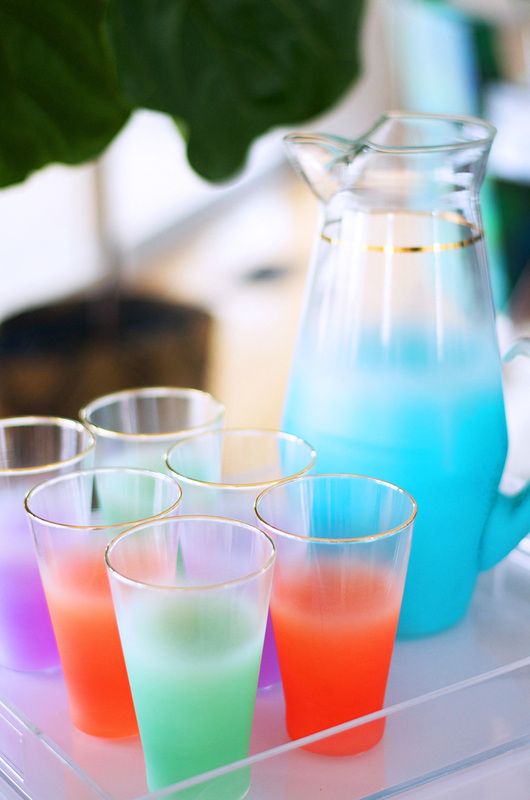 Blendo glass makes great entertaining ware as they come in cocktail and juice sets and pitchers. Because they are easier to find, you can build an entertaining set quite quickly (and on the cheap). If you’re looking for high-end vintage cocktailware, then Culver is the top contender. It’s relatively easy to find, but you’ll pay a bit more for it. Look for the “Culver” signature on the glass. Dorothy Thorpe was a mid-century American artist who designed beautiful glassware and ceramic pieces out of her Los Angeles studio. She purchased simple blank glassware, mostly crystal, from U.S. and European manufacturers and decorated them with her personal designs. She created these breathtaking designs by using a sandblasting technique. She was also known for her silver overlay and paint speckled glass pieces, which included all types of glassware and punchbowl sets. This silver overlay is now her most popular and collected pattern. While some of Thorpe’s glassware pieces are signed with a large “T” and a smaller “D”, many of her pieces found today do not carry her signature or her original logo sticker on them. Since Thorpe designed on “blanks”, the only known silver pieces that can be attributed to Thorpe are her timeless and modern, wide-band sterling overlay glass pieces. 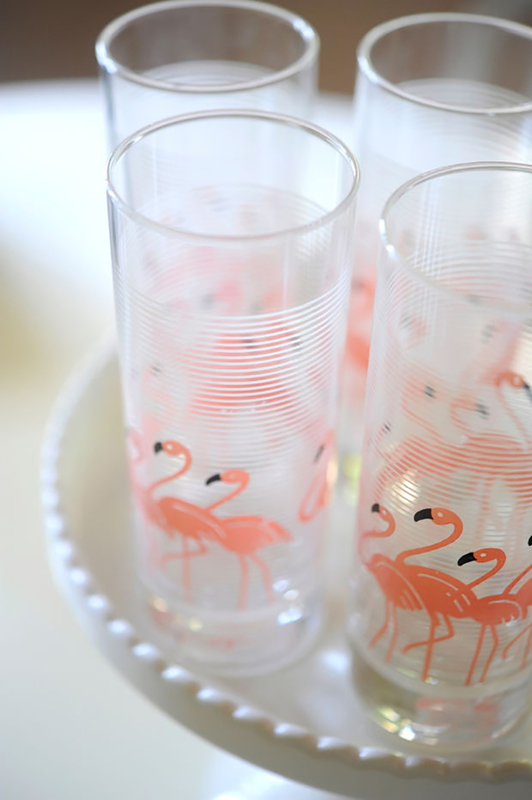 If you’re a minimalist, then Dorothy Thorpe is your go-to for fine cocktailware. Libbey is has made millions of glass tumbles – from water glasses, tea glasses to goblets and other drinkware – over the years. It was and can still be found in most American homes! Since there are many patterns to find, the most popular – and at least my favorite – include the flamingo, daisy, and travel patterns. Vintage Libbey glassware is signed with a cursive “L” within an ordinary circle or ring. The mark actually appears backwards if viewed from outside of the glass, but it appears correctly when looking down through the inside. New Libbey glassware is signed with a cursive “L” without the circle. All Briard glassware is signed with his name and appears in cursive on each piece of glassware. Arcoroc pink swirl cups known as Rosaline are a dream and pop up on Instagram and Pinterest most often. Arcoroc glassware was produced in France in the 1980s, although it is commonly known as depression glass. This glassware features a swirl patterns on a variety of glass including saucers, coupes, flutes, goblets and other glassware. The Rosaline collection is the perfect gift for a bridal shower or as a hostess gift. All images by me, except Libbey photo from here. I have pictures of glasses that look like George Briard. How can I send you a picture to see if you know whose they are. I have many Waterford also. Please help. The glass trays sound beautiful. From my research, I found that there were a few patterns that were not mass produced so they are rare and hard to find. If you haven’t been able to find any items (other than the set of glasses), then it’s one of the rare or small batch designs. I would hold onto the trays especially since they are signed and have the signature gold pattern. If you do sell, take it to a high end consignment shop to get appraised and then try to sell through an estate seller. I hope this was helpful! I am researching a set of 22k gold overlay tumblers with the signature J W in the design. I’m at a standstill. Very Culver like in looks with a bamboo and what looks like a Japanese floral medallion motif with turquoise green and blue flashing. Any ideas? Any help greatly appreciated. I have a set of 4 Culver Prado and 7 George Baird glasses with green crosses on them. Do you know where would be a good place to sell them? Thank you for your time. Hi Megan! I recommend trying Etsy or eBay. Definitely sell them as a set and check similar listings to give you an idea of how much to sell for. I hope that helps! For the other pieces, I would try a very descriptive Google search (for example, light pink hobnail saucer) or reverse image search to find out more about them. When I’m stuck, the reverse image search always helps! 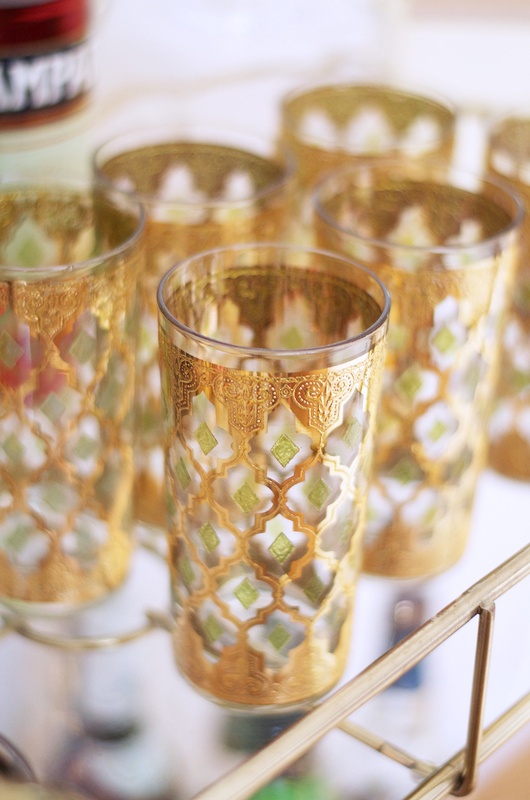 Do you know what the Asian inspired design on Culver glassware is called? Colors include gold, red and blue. I have a bowl and just trying to figure out what the name of the pattern is. Thanks. Hi Chelsea. That sounds like the Imari collection! It’s a beautiful pattern. Hi! I’m starting out at getting into vintage glassware. I was trying to look them up and find their worth and about the year they were out. How would I do that? What are your tips? I have pictures and you may have seen them before! Do the Blendo glasses always have a gold rim on the top? I have a set and the pitcher has gold trim but not the juice glasses. Yes, blendo always has a gold rim, but after a lot of use, the gold does come off. I’m guessing the glasses were used and washed enough times to slowly remove the gold rim. I hope that helps! Are all pieces in a Culver set signed? I have a cocktail set with holder, but only the martini pitcher is signed. Hi Rebecca! All glassware should be signed. It will be very small and sometimes appear on the bottom below the pattern. I have a set of 9 inch arcoroc plates. I don’t think they are very valuable but I would like to know what the number means that is between the name, arcoroc and The word France. Mine are 26, 7, 19, and 33. I searched the internet but could fine nothing regarding the number. My husband think it might be a batch number……it is puzzling. Hi Milli. I just looked at my plates, saucers, bowls and cups and none of them have that number. It’s so interesting. If I had to guess or give you some insight, I would have to agree with your husband and assume they are the batch number. Hi Annette! Does Blendo glass ever come with designs? I have a set in a yellow, blue and green each with a different type scene-covered wagon, dog sled ect. They have the gold trim but I can’t seem to find anything like this. Any assistance is appreciated. Hi Rose. Yes, there are a few Blendo glasses that have designs on them. I haven’t seen the set you’re describing, but I know there are ones with flowers, an Asian pagoda design, and some stars. I hope this helps. I have a serving dish in perfect condition it has 3 depressed sections and a gold pattern – would you know it’s worth and where to sell it ? I can send you a photo . Hello. I have an ice bucket that I believe is Culver and 3 glasses that may or may not be. I would like to know the name of the pattern and if the glasses are Culver. I tried attaching a photo but not sure if you can see it. The photos didn’t come through the comment. Have you tried a reverse Google image search? Hi, I love reading your blog but wanted to inform you that there is no Blendo Glass, it is actually Blenko. Another wonderful glass company that came from WV was Pilgrim Glass in Huntington that was know for their crackled and cranberry pieces. Happy collecting!!! Hi Jennifer. Thanks for visiting. Blenko and Blendo both exist. While Blenko is the actual glass company, Blendo is the style of glassware produced by West Virginia Glass Company! Hi Jennifer. Thanks so much for stopping by and your comment. Blendo and Blenko both exist. Blenko is the glass company, while Blendo is the style of glassware produced by West Virginia Glass Company and Anchor Hocking Glass Corp. I did a lot of research to get to the origins of the “blendo” style as it’s my favorite. I’ll have to start looking for Pilgrim glass – so pretty! I see these glasses described as Culver LTD a lot online, but they have no signature as you describe. Hi Mike. I see a lot of vintage glassware describe as Culver when it has the gold leaf detailing. This style doesn’t look like Culver to me and based on my research, Culver is always labeled. I hope this helps. It’s interesting to know about various vintage glassware. I noticed the mark you were talking about on one of my grandmother’s glasses when I visited her last month. I didn’t know that it is a Libbey glassware because I am not that familiar with vintage items in the kitchen. It’s nice to know these things, especially that I’m planning to give my sweet grandmother a gift. Thanks! I am wondering if you would be available for me to send you a picture of some glasses I got from my great grandma. I think they may be Dorothy Thorpe but would like a second opinion. Hi! I have one set of Culver and the glasses are all signed in cursive. 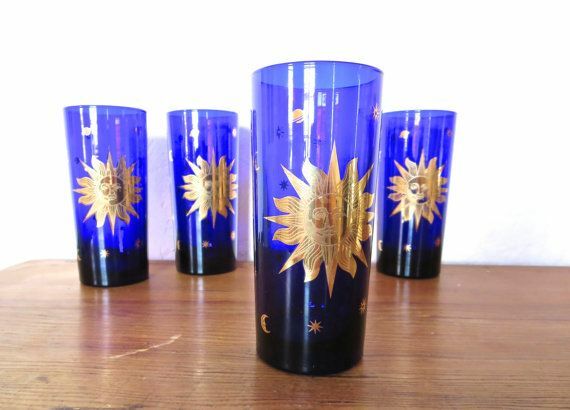 I am looking at some sets of Valencia on Etsy and eBay, and both sellers say they are not signed (and based on their experience, say the Valencia glassware often isn’t signed.). Is this possible? Are you aware of any Culver “fakes”? They look absolutely legitimate. Thanks! Hi Linda! In my experience, the Valencia is signed. All Culver glassware is signed with “Culver” – at least low ball and high ball glasses should be. Anything footed may not be. I hope this helps. Feel free to email me if you have any questions! O have enjoyed your blog. Big help since I love glasses. I am wondering how safe they are to use in terms of lead food safety… do yours ever any ideas? Hi Roxy! I’d recommend looking at Etsy and eBay to determine the value. I’d say sets are usually more valuable than just pitcher or glasses. Hope that helps! I have a pair of Georges Briard glasses and am searching for the name of the pattern. They have gold and peach (beige?) arcs on them…almost rainbow like at thrE base of the glass’ then a second level of “rainbows” on top. The rainbows are only on the bottom half or so of the glass. Can you tell me what the pattern is called? I did try a reverse google images search and it was no helpful. Thank you so much!